Evelyn Glennie :: TicketServices.gr " // + "
Your booking is valid provided you check in at least 30 minutes (19:00) before the performance starts. Please make sure that you arrive on time, otherwise your seats will be allocated to other visitors. Evelyn Glennie is coming to Summer Nostos Festival 2018 to perform a special concert. 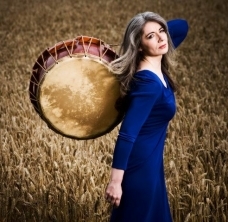 Scottish solo percussionist Evelyn Glennie, a deaf composer who records music for cinema, television and music libraries, is coming to Summer Nostos Festival 2018 to perform her solo percussion works, accompanied by Academica Athens Orchestra, under the direction of the conductor Nikos Tsouchlos. Glennie has been deaf since the age of 12 -having started to lose her hearing from the age of 2- and claims to have taught herself to hear with parts of her body other than her ears. Evelyn Glennie is the first person in history to create and maintain a successful full-time career as a solo percussionist. “I still remember the smell of the tiny annexe room where my first µtrialΆ percussion lesson took place. I also remember the ecstatic feeling of holding a pair of drum sticks...", she has said. With over 90 international awards to date, including a Grammy and Polar, as well as a BAFTA nomination, Glennie is a composer who continues to inspire and motivate people. The film Touch of the Sound and her enlightening TED speech in 2003, in which she described how she feels music in different parts of her body, remain key testimonies to her approach to sound-creation. Evelyn Glennie performs worldwide with the greatest conductors, orchestras and artists. One of the most important moments of her career was the first percussion concerto in the history of The Proms, at the Albert Hall in 1992, which paved the way for orchestras around the world to feature percussion concerts. She also had the honor to take on a key role in the Opening Ceremony of the London 2012 Olympic Games, where she collaborated with Underworld on the soundtrack and performed live in the stadium. Throughout her career, she has had the opportunity to collaborate with a diverse range of artists, including Björk - Glennie was featured on Björk's album Telegram, performing the duet "My Spine". EvelynΆs recordings, which now exceed 30 records, are as diverse as her career on-stage. Shadow Behind the Iron Sun and Sound Spirits continue to be the bestselling albums that richly demonstrate her brilliant improvisational skills. Academica Athens Orchestra's first appearance in front of the Athenian audience was in November 28th, 2013, at the "Aris Garoufis" hall of the Athens Conservatory. In the recent years, it has been noticeable in AthensΆ music life.